This week, our Orchard Gardens Farm apprentice, Nicolas Matallana (or Nico for short), has recorded a bit about his experience this summer. We are grateful to the Missoula Federal Credit Union for funding his position, enabling him to learn about farming and nonprofit operations. It also helps us grow Orchard Gardens as place where those of any income can eat fresh—-whether that means bringing a prescription, a few bags to fill, or a few seeds and a caring hand. 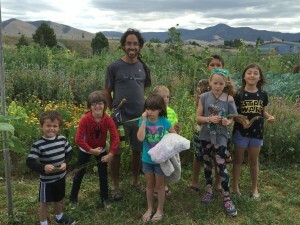 Nico originally came to Missoula to explore the mountains and learn about the ecology while pursuing a degree in Ecological Restoration, but little did he know that local food would strike his passion. Nico has been gardening and volunteering on farms since his first semester in Missoula. I’m going to tell you about a youngster that I got to know this summer. He lived in the Homeword housing complex, next to the Orchard Gardens Community Farm. Let’s call him Carrot. As a five year old, he was too old for the resident play structure, but still too young for Kindergarten, so he would spend his days looking for something, anything, to let him let out his creative energy. From the field, I would often see him speed by on his bike, yelling unintelligibly, as he lapped and lapped the housing complex. It reminded me of the endless summer days of my childhood, biking or skateboarding back and forth on the curb, trying to spend an unlimited amount of energy. He wasn’t usually allowed to come into the farm, so he would often swoop on us while we hauled our harvest across the parking lot to the barn. “We’re getting ready for the CSA.” One of us would respond. And so on, he would hang around and ask questions and linger and pick up things he shouldn’t and we’d sometimes have to kick him out. But he would always be back, laughing and goofing off the next day. My co-worker, Michelle, was the true wizard at keeping him busy. She’d see him coming towards us and immediately find something to entertain and occupy him. “Do you want some kale?” She’d ask. And off he’d go munching on his cucumber to chase around the other neighborhood kids. He ate most things that came out of the field, which impressed me for his age – I certainly didn’t eat so many vegetables when I was that young. When good things were being offered, like apricots or cherries, the entire neighborhood kiddo-herd would come, flocking around us impatiently. “What do you say first?” Michelle would remind them all. We knew this was a special place for Carrot. While the other kids came and went, Carrot came by consistently. When Dave was out running errands, he would ask where he was every couple minutes. If we were busy in the field, he would always ask us when CSA was, which he knew was when he could get our attention. At first, entertaining him felt like another job, but over the summer I grew to appreciate his persistence. I wish I had grown up with a farm next door, with a Dave and Michelle to put a cucumber in my hand when I needed something to do. My neighborhood friends and I would get so bored that we would eventually end up in trouble, and over the years it just got worse. Carrot sometimes got in trouble, but handing him a vegetable would usually do the trick. Next year he will be in Kindergarten. I’m sure he’ll come around every summer, looking for a snack or a human to talk with. And it will be the farm employees, the vegetables, and the community gardeners that will welcome him. I’m glad the farm can keep him out of trouble. Maybe he’ll even be a farm apprentice one day.